Priced at $20, I almost bought one but decided against it, in part because it was just one size. A little internet surfing turned up the pictured set of collets on ebay for $55 free shipping. 7 sizes, 1/8” to 1/2” in 1/16” increments, for an MT2 taper. A piece of 3/8-16 all-thread to thread into the back of the collets and go through the spindle head, and a shopmade threaded handle to tighten, and I’m in business. Now I can hold about any size screw, bolt, shaft in the spindle and turn the wood perfectly concentric to the center. 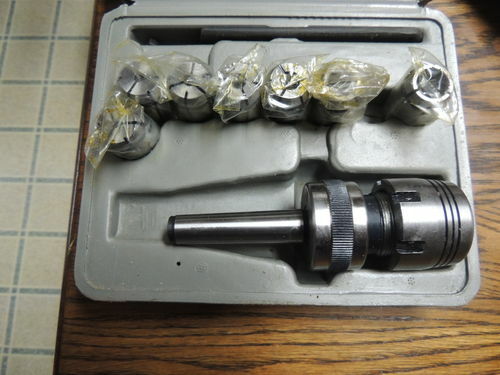 I have a set of collet chucks from LittleMachineShop.com.I love mine.I paid a little more though.Thanks for the review. What I forgot to say is they are for an MT2 taper, which I have edited. there are 7 pcs sized as described. This seems to be what he found, from allindustrialtoolsupply, which may be different from the actual allindustrial brand. Seems like a really cool set for those who do small items. Like that set. 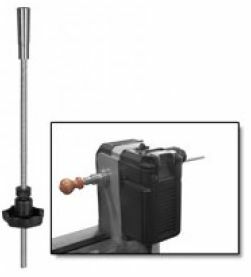 Found this posting interesting as I never thought of using them on the wood lathe, I have a set for my milling machine of a different taper. Off shore but nicely machined. Then I bought a collet chuck and collets, inexpensive also, used it on mt metal lathe to make a perfect on center Vee Drum sander drum. Any way I see from your post it would be useful on the wood lathe to. It goes up to 3/4 and is a No. 2 morse. Do not know where I got it, Here is a picture of it. I would say in the 50 to 75 dollar range. Threaded for a hold in rod. There is one like that on Amazon from ETD, same box, same looking set, for $163. Too rich for me… If you scored that for $75, nice!